Polish artist duet Sepe and Chazme made a large yet detailed mural for Vilnius Street Art Festival in collaboration with the Polish Institute in Vilnius. The mural is called “Corest Fity” – an allusion to the lost relation between the people and the nature. The building the artists worked on is interesting because of its’ side wall which is actually a firewall. When the building was built there were plans to extend the street and build another building, however this has never happened. In the architectural sense the building is incompleted and the mural on its sidewall is a symbolic conceptual finish. In Vilnius Italian street artist Millo has created his very first site-specific mural incorporating existing windows and other architectural details into the painting. As Millo claims, he is becoming a little bored with paper white plain walls, so he was excited for a possibility to play with architectural details in his mural given his educational background in architecture. The wall that Millo chose for his project in Vilnius is well known for its strategic location – the building is just opposite Hale market, one of the most charismatic and oldest markets in Vilnius, Train station district. During Vilnius Street Art Festival MOBSTR has made his biggest mark ever – a large scale statement on a Soviet modernist building in Vilnius. This is a subtle remark towards the growing and quickly changing movement of the global street art. Anonymous artist Mobstr is famous for ironic, tongue in cheek and site-specific phrases that most often than not appear in the cities illegally. 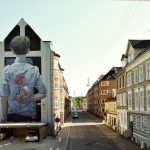 This year the third Vilnius Street Art Festival entered the train station district in Vilnius, Lithuania – an area usually perceived as a controversial part of the town. But looking from the point of transitional spaces, the area provided a lot of ideas for contextual art, with one of them suggesting that the city’s airport should be considered as a modern-time station. Therefore, the organisers of the festival entrusted this strategically important space for one of the most active Lithuanian street artists – Antanas Dubra who in the territory of Vilnius Airport transformed an old water tower into a tale of the night and the aviator’s dream to reach the moon one day. Technically difficult the work is named “The grumpy side of the moon” can be seen both during the day and the night because of the installed night-light. Brazilian twin artists Osgemeos came back to Lithuania with a very personal mission – to pay respect for their grandfather who is of Lithuanian descent. In their mural for Vilnius Street Art Festival brothers incorporated a picture of their grandfather sitting in a palm of a colourful giant – a very recognisable style with a unique Lithuanian twist.